Looking for deeper insight on markets? In tonight’s Closer sent to Bespoke Institutional clients, as an increasing share of S&P 500 companies are becoming overbought as seen through RSI, we take a look at the forward returns in the next week. We then take a look at high yield spreads which are confirming the current rally. We also show how crude oil’s current rally could begin to stall. Moving on to the stock market’s internals, we show a decile analysis of the S&P 500 given metrics like performance during and after the Q4 2018 sell-off, P/E, and market cap. 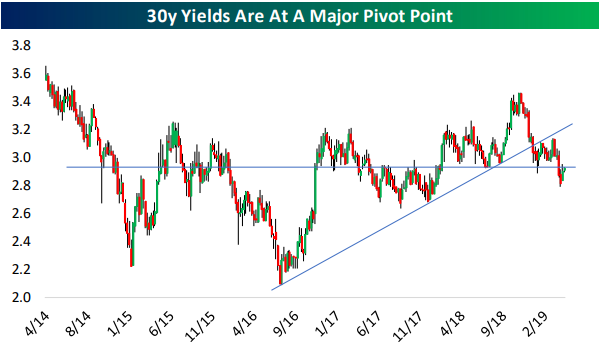 Next, we turn to the technicals of the 30 year yield as it approaches a major pivot point and how the market is beginning to price in rate hikes again. We finish with a note on Canadian housing data which has seen a slowing in starts.